All Level 20+ players are eligible to participate! 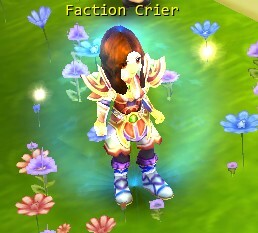 From Monday to Saturday, Level 20+ players are qualified to claim Nameplate 1 to Nameplate 6 from the Faction Crier and exchange one Nameplate or many Nameplates together for Exp and Talent Points. 1 Nameplate can only be exchanged for a random amount of Exp. For example, a Level 45 player can exchange any Nameplate for 45800 Exp. Players can exchange Nameplate 1 + 3 + 5 or Nameplate 2 + 4 + 6 for 3 times more Exp or Talent Points than if they only exchanged 1. If they also pay some Gold, B-Gold or Silver, even more Exp or Talent Points will be obtained. For example, a Level 45 player can exchange Nameplate 1 + 3 + 5 for 3x45800 Exp or 3x7 Talent Points. If they pay an additional 312 Gold, they will obtain 9x45800 Exp or 9x7 Talent Points. Players can exchange Nameplate 1 + 2 + 3 + 4 + 5 + 6 for 6 times more Exp or Talent Points than if they exchanged 1. If they also pay some Gold, B-Gold or Silver, even more Exp or Talent Points will be obtained. For example, a Level 45 player can exchange Nameplate 1 + 2 + 3 + 4 + 5 + 6 for 6x45800 Exp and 6x7 Talent Points. If they pay 1377 Gold, they will obtain 24x45800 Exp and 24x7 Talent Points.